Eileen Byrne has been acting since she was fourteen. She joined the Meredith School of Acting in Dun Laoghaire when she was a teenager and has been acting with varying degrees of intensity since then. ‘I am too old to remember all the plays I did’ she says. Highlights of those earlier years were Juno in ‘Juno and the Paycock’, Elizabeth Proctor in ‘The Crucible’, Amanda in ‘Private Lives’, Raymonde in ‘A Flea in Her Ear’, Opal in ‘Everybody Loves Opal’, Elvira in ‘Blithe Spirit’, Hannie in ‘Lovers meeting’. Eileen’s career went into pause as she gave full attention to raising her family of six children. Since returning to work she has concentrated on screen acting. She played the long suffering mother in the hugely acclaimed Kerrygold TV commercial and has featured in many other commercials. 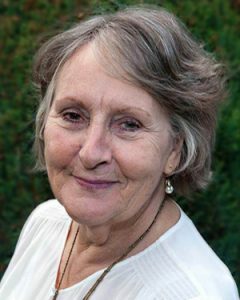 Her drama work on screen has included several films and tv dramas including ‘The Cabin,’ The Clinic’ , ‘Uncle Max’, ‘Rebel Heart’, ‘The Breakfast’, ‘Tam O’ Shanter’, ‘Pictorial Weekly’ and most recently ‘Grace Harte’. Title Part Director Production Co.
Random Passage Mrs. Brockwell Cape Random Prod. Ltd.
Rebel Heart Neighbour Delvincroft Ltd.
Dept of Social Welfare Corporate Video A.I.B.